My next journey is one I had been contemplating for a long time – sleeper train from Paddington to Cornwall, a day at the Eden Project near St Austell and then the train back up to the South East during the day. In September this year, my cousin in Devon invited us all to celebrate the birth of her daughter and I used this as the excuse to do the trip. I set off from platform 1 at Paddington station with a view of the bronze of the bear from my window. 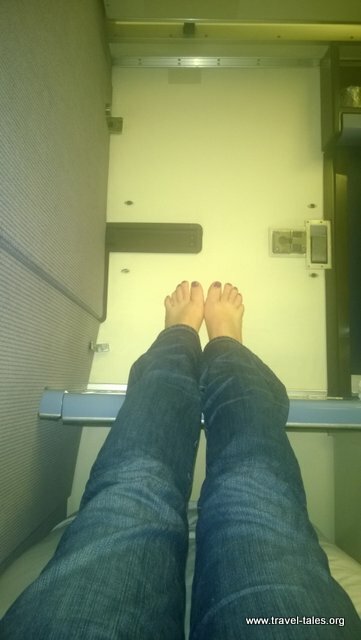 I paid the single supplement for the sleeper cabin, so the upper bunk was not lowered. It was quite snug but perfectly adequate with a basin with running water, air conditioning temperature control and the bunk to sleep on. On my arrival in St Austell I needed to wait for an hour or so before catching the first bus to the Eden Project. The views of the coast are spectacular, however from the bus which was moving around the narrow lanes only one picture is really good enough to share.